The Chicago Park District put up a new jungle gym last week in Burnham Park, with adults in mind. The Burnham Park Outdoor Fitness Station, located at 39th Street right by the Lakefront Trail, was designed to look like a playground, but with more complex apparatuses for adults to use as fitness equipment. Equipment on the park includes incline benches, rope climbs, monkey bars, pull-up bars and a horizontal rock wall. Designed by Park District planners, Burham Park was inspired by Muscle Beach gym in Los Angeles. 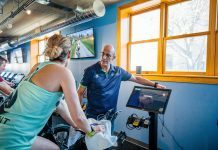 The increasing popularity of high-intensity strength training, like CrossFit, was also a factor behind the project, Kelly says. 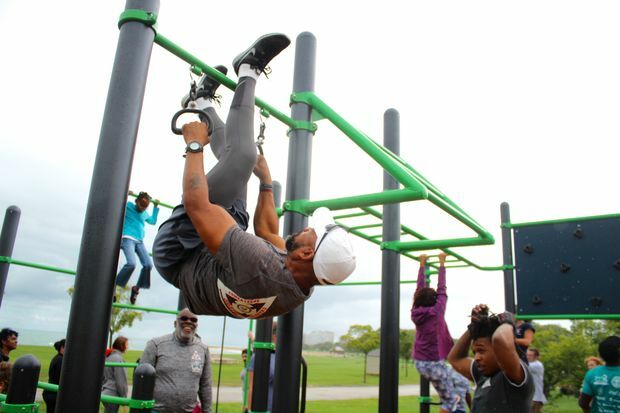 Burham Park is the first outdoor fitness park in the country, but account executive for Coca-Cola Mike Carroll, who funded the project, says more “adult playgrounds” will soon be popping up throughout the city. The outdoor fitness station is the latest part of Mayor Rahm Emanual’s “Chicago Plays” initiative, which has powered the construction of more than 325 Chicago playgrounds since 2011, DNAinfo reports.